Promote worker and visitor safety in emergencies with highly visible evacuation signs. Our ready-made and customizable emergency evacuation route signs point the way to the nearest exit point and assembly areas. Identify evacuation routes for a wide range of events, including Emergency Evacuation Route Straight Arrow, Evacuation Route Left Arrow, Emergency Shelter, 3-Way View Fire Safety Severe Weather, and Custom Shaped Engraved signs in various styles, shapes, and sizes. For helpful evacuation resources, view our Evacuation Guidance System and Exit and Evacuation Checklist fact sheets. Mark emergency exits and non-exits clearly with evacuation route signs with and without arrows. 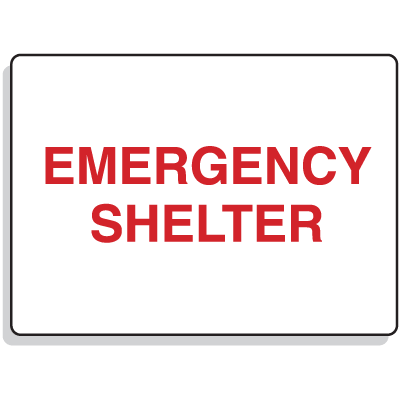 Indicate a clear path to evacuation routes, assembly areas, and emergency shelters with evacuation signs and accompanying emergency evacuation frames and holders.